Our perfect planet didn’t plop into the sky on the perfect axis, rotating at the perfect revolutions, having perfect tides, with the perfect amount of oxygen, and a list of wonders to accommodate each species ability to thrive in heat, cold, etc. The man-made decision to annihilate our own environment can’t be more stupid. Each of us depends upon the cooperation of each other. Reading this book must be step one to understand why our behavior is now going to create self-annihilation. 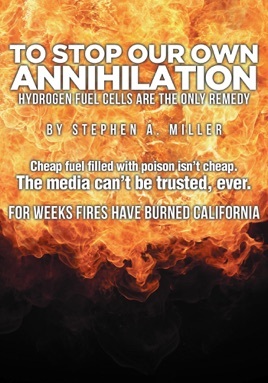 The scientists have failed to grasp the obvious remedy to prevent annihilation is converting the entire power industry to hydrogen fuel generating electric power from hydrogen fuel cells. Using free solar and wind to generate electric power needed to split the free H2O molecule by electrolysis. No risk can be more severe than the extinction of most life on earth. Ignoring the remedy to eliminate this risk at this time is the height of self-destruction. Nobody in a trance can physically feel being in a trance. I was told by one person that Americans aren’t asleep. She presumed a trance made people sleepy or drowsy. In fact, we’re all wide awake. Being wide awake but doing irrational, self-destructive things on a regular basis that are stupid is the actual indication to know you’re in a trance. Voting for Trump or Hillary qualifies. Ignoring the remedy for climate change is hydrogen to replace fossil fuel. The most important, obvious indication you are in a deep trance will be any hesitation to demand the replacement of fossil fuel immediately with hydrogen on a worldwide scale. Bridgeport, Connecticut has a 15-megawatt hydrogen fuel cell that powers fifteen thousand homes.